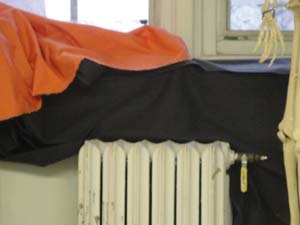 Once again, a student has made a donation to the Evanston Art Center in my honor. I feel indeed honored and grateful. Turns out, this is a student who studied with me a while ago and then didn’t sign up for the more recent term because of a time conflict, but has become an avid reader of this blog. That’s good, too. I do hope these posts are of some use. Let me add something from the classroom here. During our last drawing class in December, we had a model. I often draw along with individual students, and I stroll through the room and quietly point out problems with their drawings, but I also have some quiet time for my own little meditations. I like to look out at the lake, for example. It’s a major presence, always interesting. That day the water was calm and slightly bluer than the pale gray sky that was brushed with a pink haze. 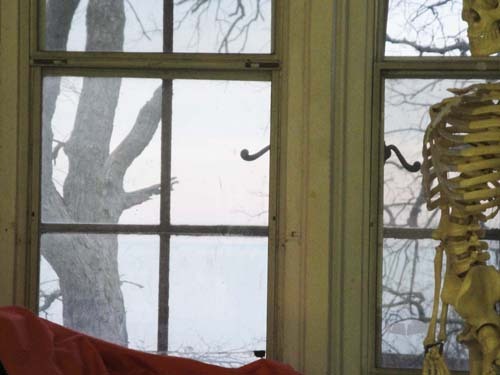 Outside, bare trees on one side of the window and on the other, inside, the skeleton. I framed a shot. Nice, I thought, the death of winter is upon us and here we have the skeleton to underline the metaphor. That thought didn’t last long. I caught myself in this cliché. How trite: bare trees, skeleton. 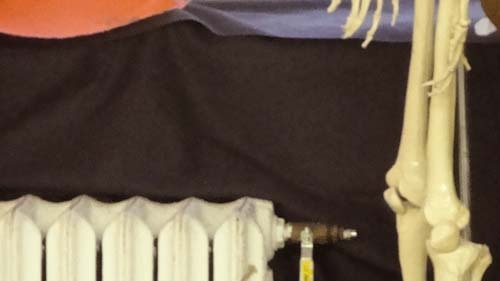 So, I zoomed in a little, noticing how the radiator echoed the bone shapes. That’s better, now we’re playing with forms. 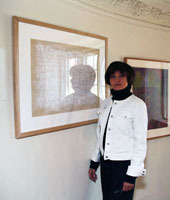 The forms create a correspondence within the picture frame. This creates a centripetal force in the image and keeps the attention from wandering to verbal references, as in the first frame. So now I’m getting warm. One more frame. I really zoom in. Now the skeleton is barely there (sorry) and the radiator is more rhythmic than functional and it really relates to the bones now. On the top we have a couple of color dashes and in the middle we have—what?—nothing, a black mystery. There’s not enough information to tell us where we are. That’s good. Your mind does not wonder. No narrative, just these peripheral shapes holding your focus. Seems to me, this last frame gets to the point better than the first frame. All this took no more than two minutes.